To look at him, Griffin doesn't seem like he'd be smarter than your typical 4-year-old—he's a bird, after all. 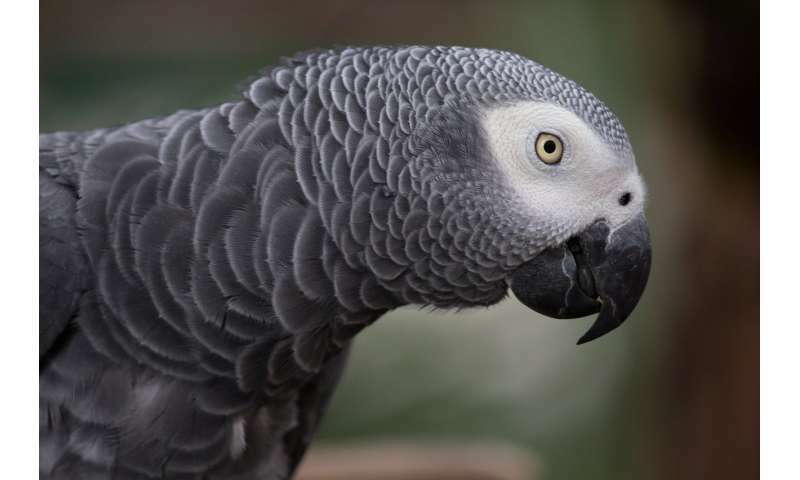 Yet the African grey parrot can easily outperform young children on certain tests, including one that measures understanding of volume. The classic Piagetian test works like this: Show a child two identical glasses of juice and ask which he or she wants. The child will giggle and say the amounts are the same. Then pour the juice into separate containers—one tall and thin, the other short and squat—and again ask the child to choose. Until about age 6, children typically choose the taller container, believing it now holds more. Griffin, by comparison, wasn't thrown—and was even smart enough to see through subsequent tests designed to fool him—in experiments conducted by Irene Pepperberg, a research associate in Harvard's Psychology Department, and Francesca Cornero '19. The bird was shown two cups with different amounts of juice, which were then poured into cups—one with a false bottom designed to make the new cups look equal. Each time, Griffin recognized which cup held more, even when the researchers crossed their arms while pouring in an effort to confuse him. "We first performed tests to see if he would pick the cup that has more, and whether, when we poured them into new but identical cups he would be able to track our hand movements," Pepperberg said. "Then we showed him which has more and which has less and poured the juice into containers that look like they're the same but that are rigged. The idea is that if he's tracking our movements, he can remember which cup has more and won't be fooled by what now looks the same." These tests are just one way Pepperberg and Cornero explore the intelligence of birds in an effort to better understand the roots of human intellect. "The idea here is that in their environment, [birds] would need to know that changes in appearance have no effect on quantity: for example, that a squished piece of fruit has the same amount of nutritional value as an un-squished piece of fruit," Pepperberg said. "Birds are separated from us by 300 million years of evolution, and their brains are organized differently than ours … but obviously this type of knowledge is evolutionarily important, because they have it."